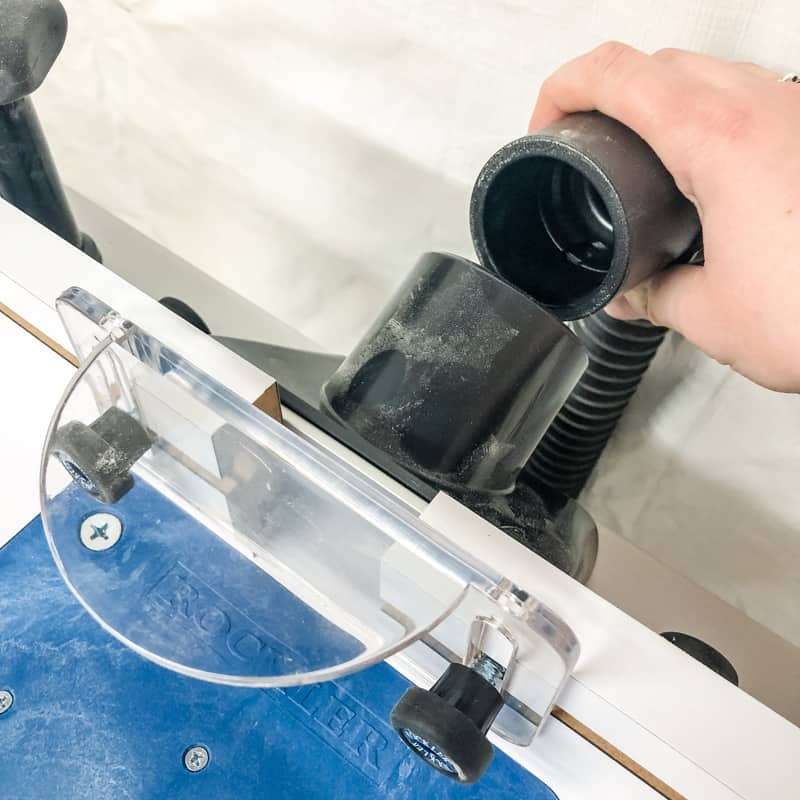 This IKEA Trofast hack is the perfect benchtop tool stand! 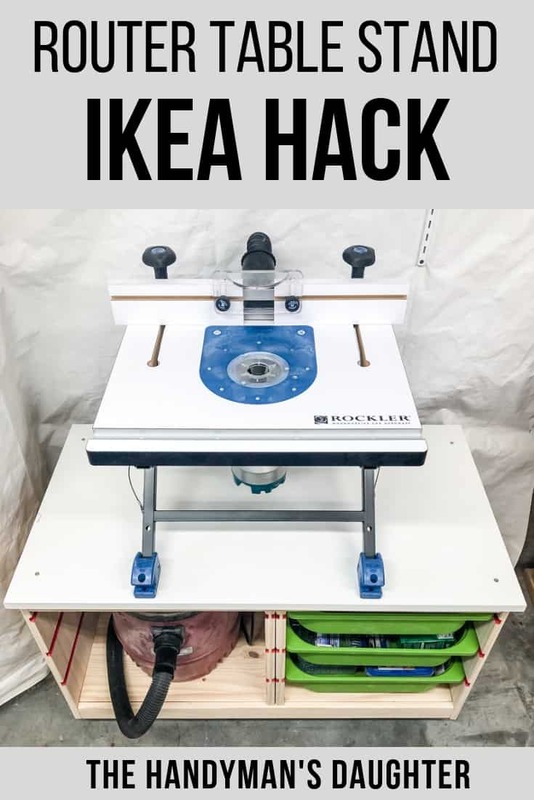 It puts your router table, drill press or band saw at the right height, with storage underneath for bits and a shop vac! Despite the name, benchtop tools aren’t great to use on the workbench! They sit way too high, making them uncomfortable and unsafe. This IKEA Trofast hack takes the popular kids storage furniture to a new room of the house: the workshop! Its low profile and sturdy wooden frame makes it the perfect mobile benchtop tool stand! After putting the router table together, I quickly realized the problem. My workbench is WAY too high, which puts the spinning bit at throat level! Never a good idea! I started working up a plan in SketchUp for a new stand with room for a shop vac and a drawer for bits, but then I remembered the IKEA Trofast in the corner. With an inkling of an idea forming in my head, I brought the router table up to the playroom to test it out. It was a bit too narrow, but the height was perfect! I quickly sanded off the rest of the peeling paint, although I didn’t bother with the drawer grooves. 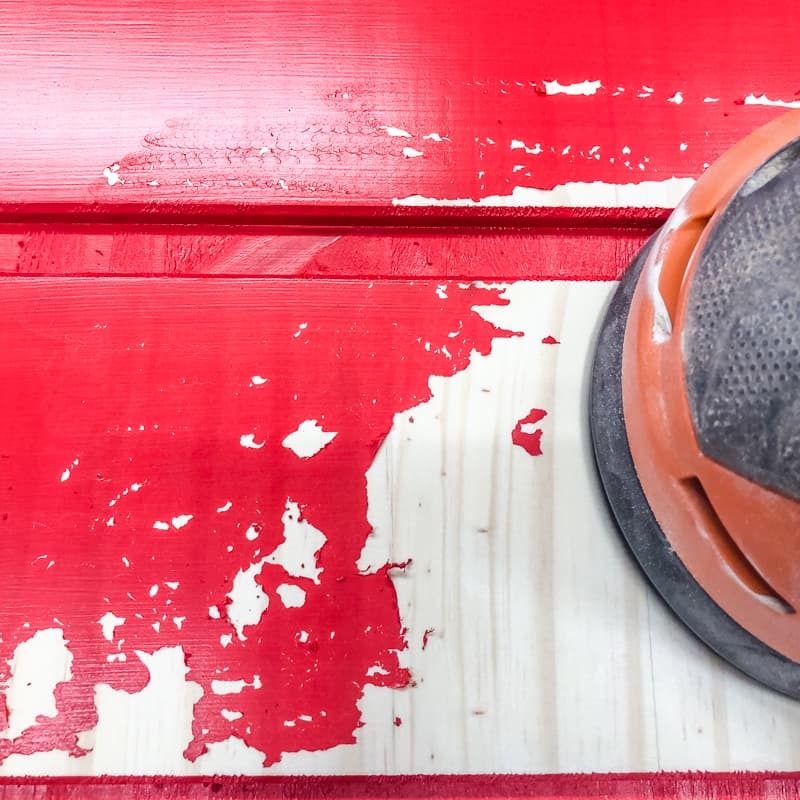 The red paint was sticking pretty well in there, and shop furniture doesn’t have to look pretty! 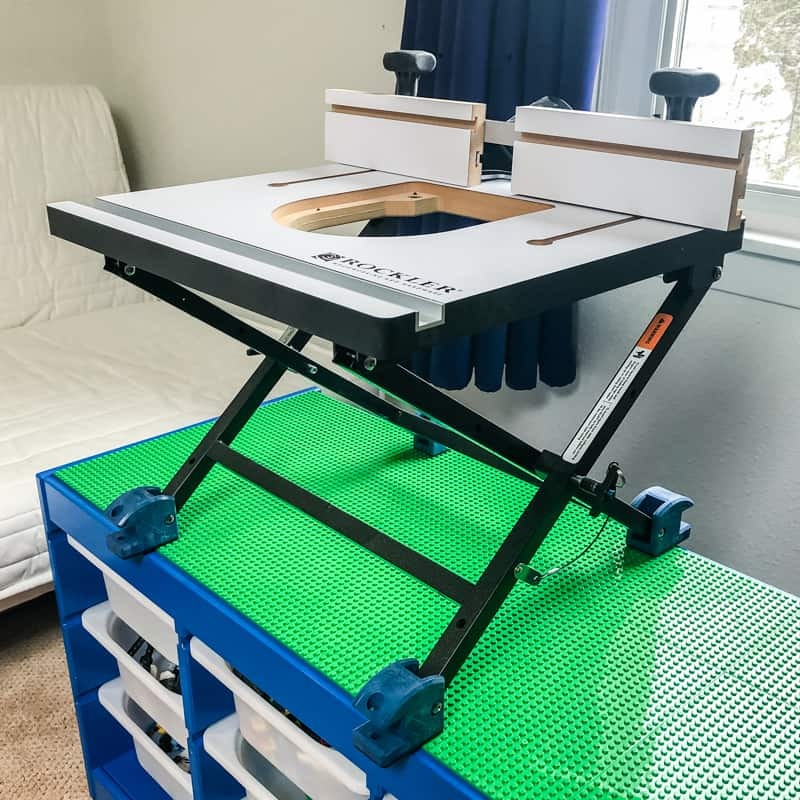 With a fresh slate, it was time to turn the IKEA Trofast into the perfect mobile benchtop tool stand! 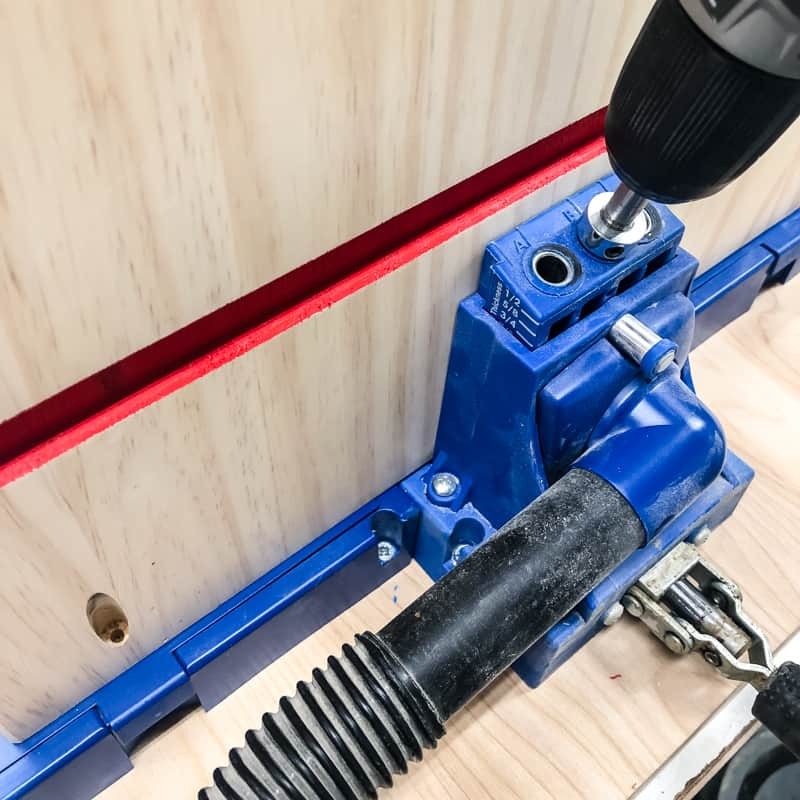 Learn the difference between the Kreg Jig R3 and K5 and decide which one is right for you! I had an old shop vac that had been gathering dust on my miter saw stand since I made my miter saw dust hood and hooked it up to the dust collector. The spacing of the IKEA Trofast drawers was too narrow, but I could change that! 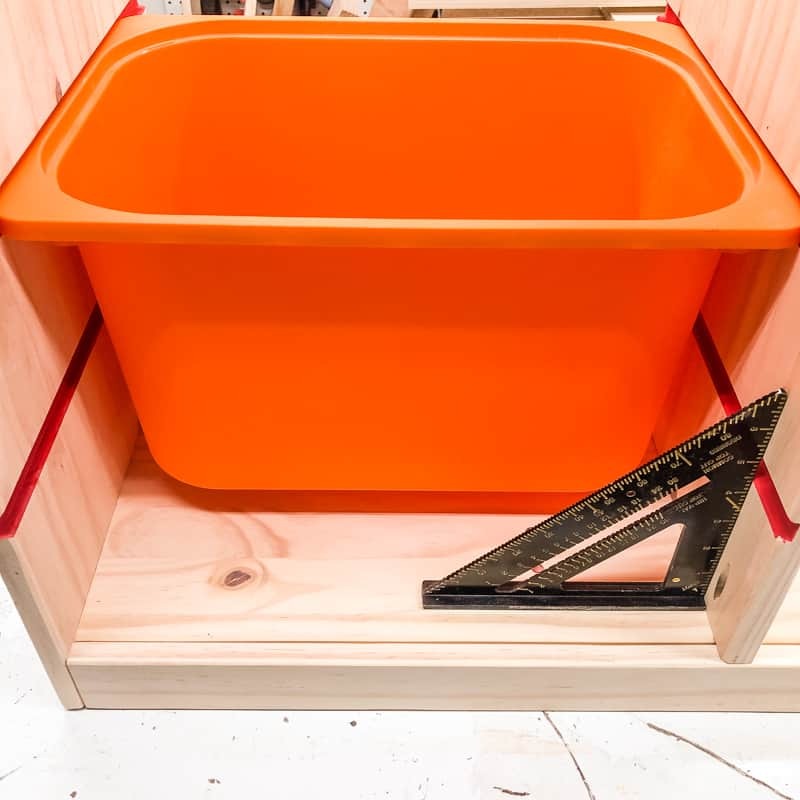 I assembled the bottom and sides, then tested the fit of one of the bins when inserted sideways. Now there’s plenty of room on the other side for the shop vac! Since I would be left with an extra divider anyway, I decided to double up on the center support. If you’re planning to put a heavier tool on the stand, I would recommend using the extra divider to support the side instead. 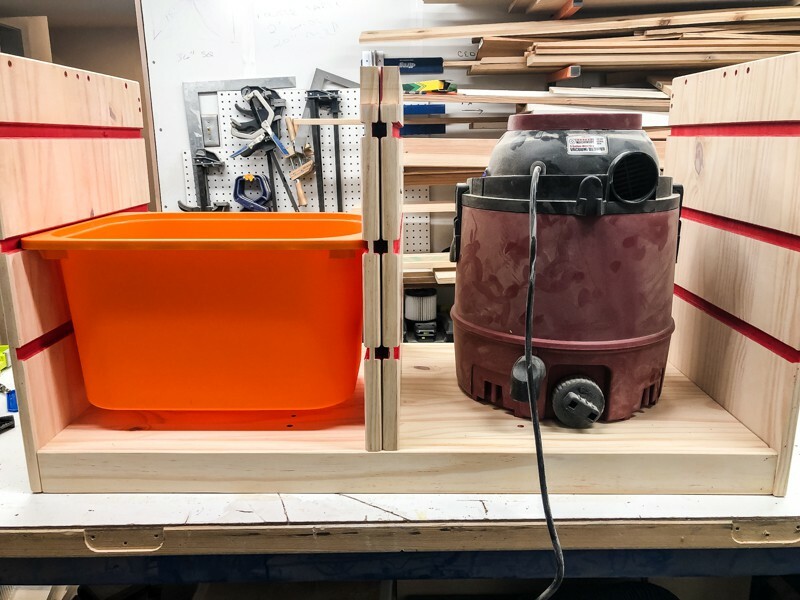 I’ve been thinking of adding a benchtop bandsaw to my tool collection, so I might move the divider over to the other side of the shop vac to keep the top from sagging under the weight. Since I was deviating from the original IKEA design, the dowels and screws no longer line up. Instead, I drilled pocket holes along the top and bottom. Use the square to make sure the divider is straight both horizontally and vertically, then screw it into place with 1 1/4″ pocket hole screws. Repeat for the other divider. Test the fit to make sure the bins can slide easily, then finish building the rest of the IKEA Trofast. Flip the entire unit over. 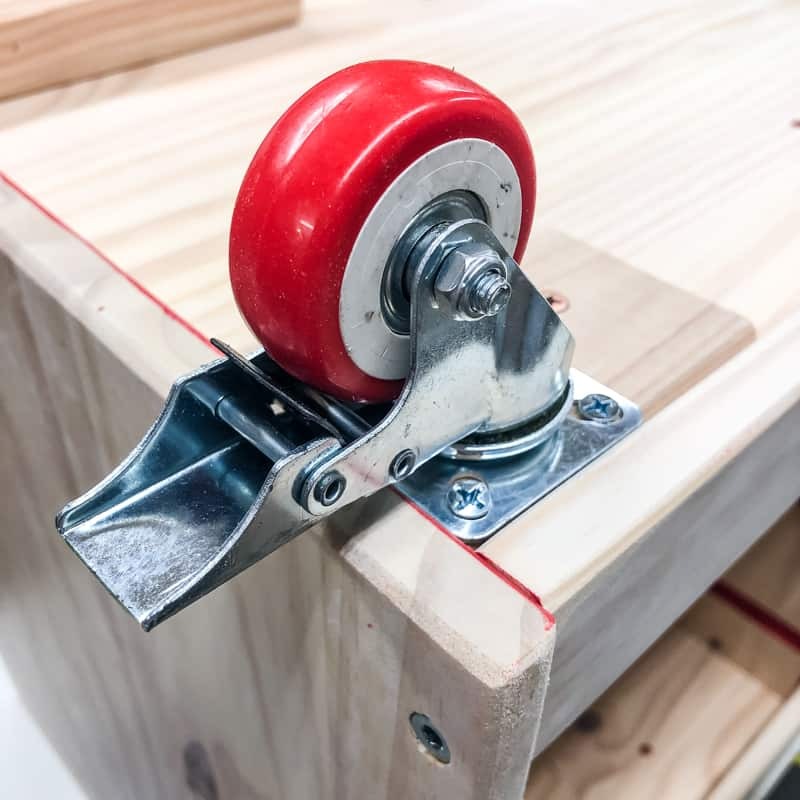 Screw scrap pieces of 2×4 inside the corners to raise up the casters so you can access the brake easily. Then attach the casters to the 2×4 pieces. The top of the IKEA Trofast isn’t quite flat, because the ends stick up slightly. I’m planning to use a melamine sheet as the top, and it can sag over time if the center isn’t supported. 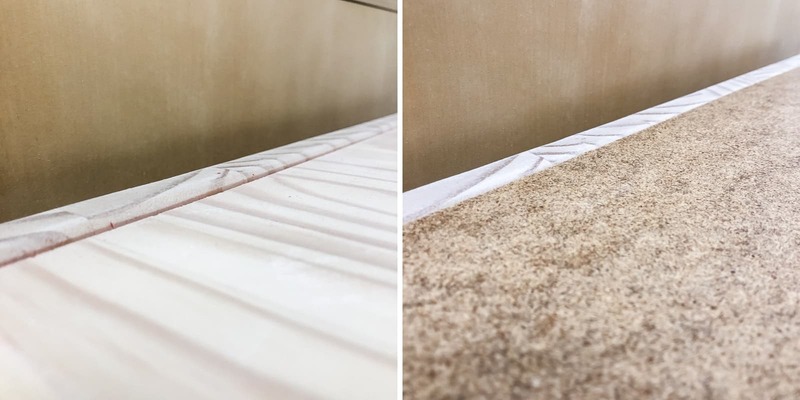 To fill in that gap, I cut a piece of 1/8″ hardboard to the exact dimensions of the lower portion of the top and nailed it into place. Now the top is the same height throughout! My benchtop router table feet were hanging off the edge, so I needed to add a larger top to create a solid surface to clamp onto. 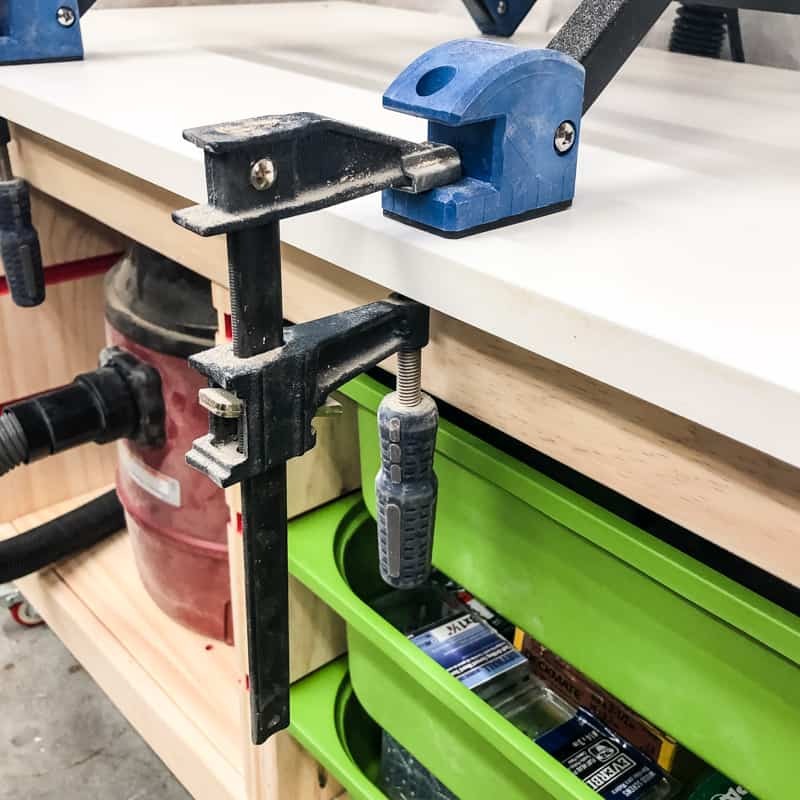 You can find melamine sheets at the home improvement store that are pretty close to the dimensions needed for this benchtop tool stand. I trimmed mine to 20″ x 37 5/8″, and screwed it down with 1 1/4″ screws. The extra width gives me a bit of overhang to clamp the router table into place. You could also screw it down for a more permanent solution, but I wanted the flexibility to move it over when I add more tools. I’m pretty excited about my latest IKEA Trofast hack! Now I have a mobile benchtop tool stand that sits at the perfect height for using the router table and other tools safely. 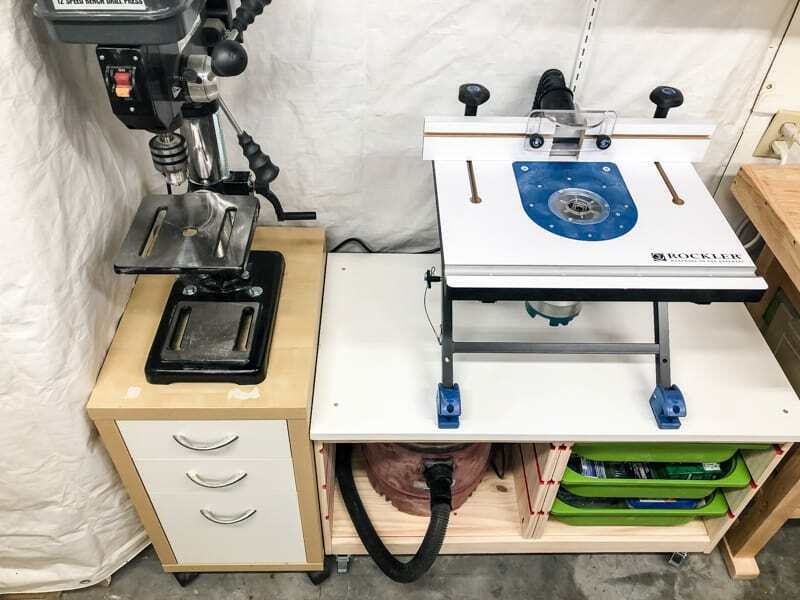 The shop vac sits underneath, and is connected to the router table with the Rockler small hose dust port. It’s easy to pull out and switch to another tool. I stole three Trofast bins from my son’s playroom to slide into the other side. One holds all the router bits and tools, and the other two keep regular screws and Kreg pocket hole screws in one spot! Adding these two tools to my workshop will make a big difference in my projects going forward. I already have plans for something that will use both of them that I’ll share next week! 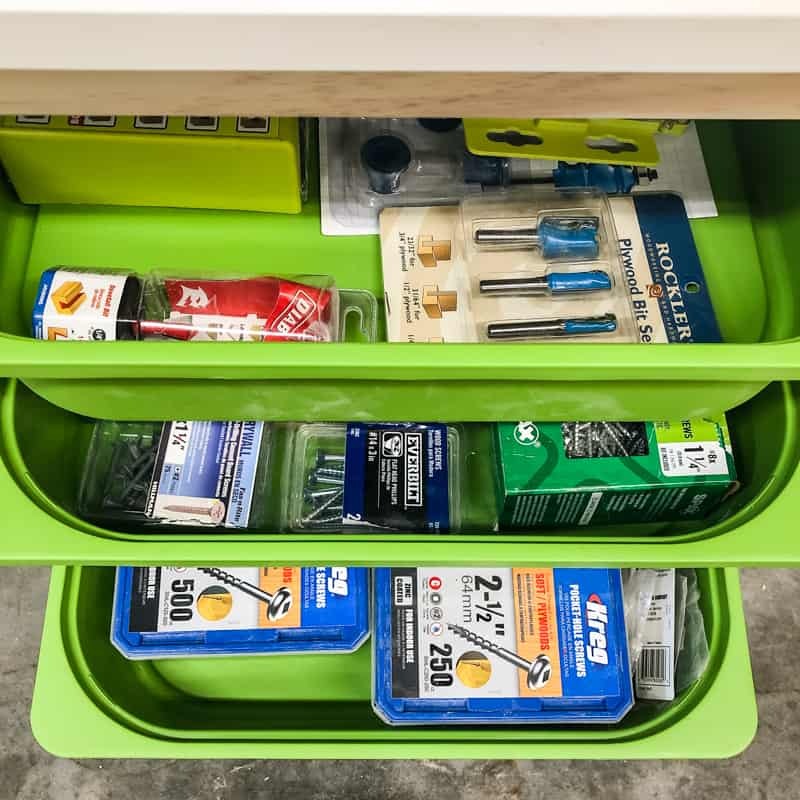 Want more workshop storage ideas? 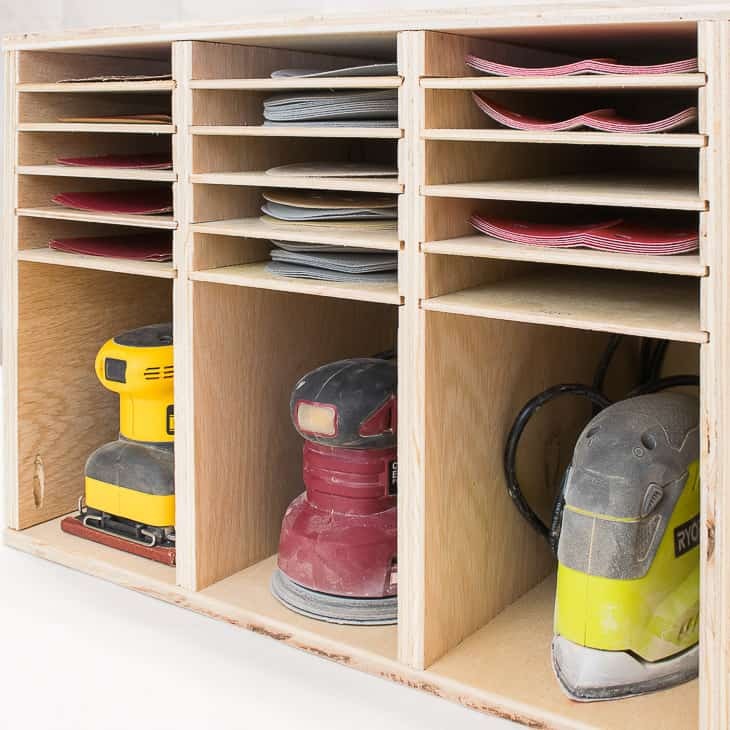 This sander and sandpaper storage keeps all those grits in one spot! 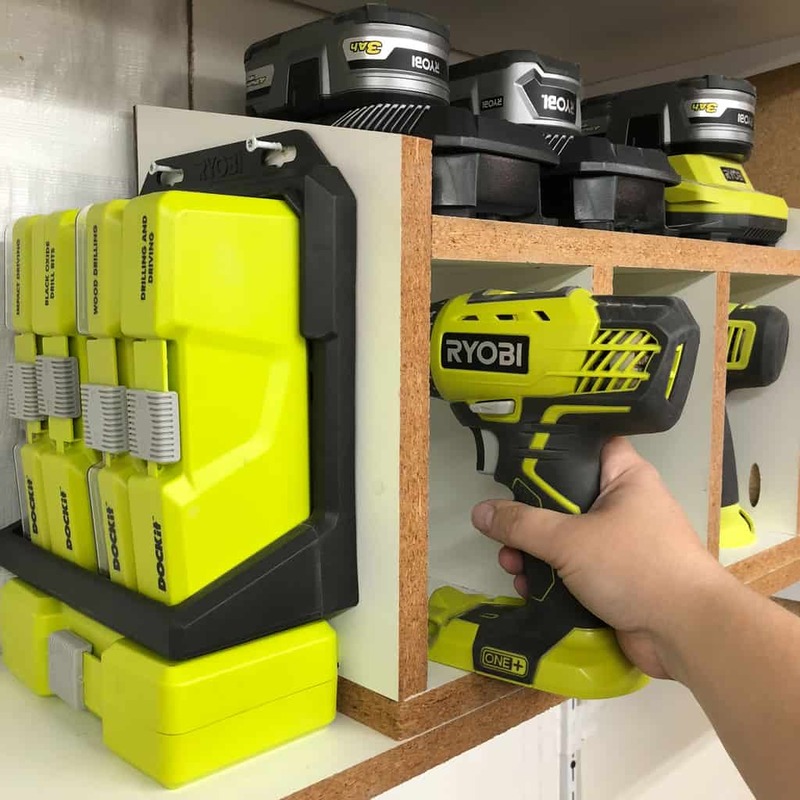 Or how about this cordless drill storage rack? 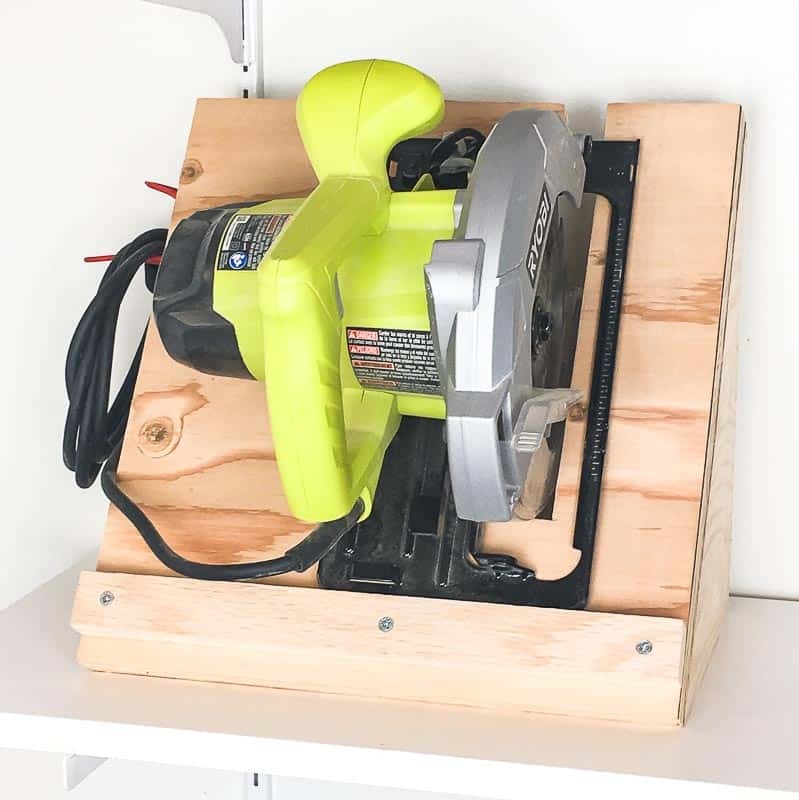 Keep your saw blade from bending with this circular saw storage rack!